A tiger fish-art-installation was designed during 13th Participatory Design Conference. The researchers Alettia V. Chisin, Jihan van Niekerk and Mugendi K.M. M’Rithaa were the prime movers for the design of the installation, which was part of a larger long-term project that involved local citizens and bachelor students from Cape Peninsula University of Technology. The tiger fish breed was regarded as the symbol of power and survival. 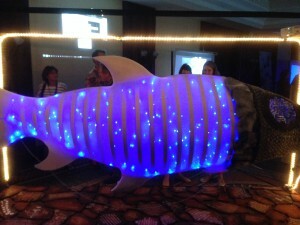 The installation, tiger fish, itself bore the imprint of other symbols such as death, decay and life – a deliberate choice by the developers and researchers who wanted to draw attention to overfishing, pollution and a general overload of our ecosystem. You can watch a video of the stunning art installation below, which was composed of recycled materials. The researchers had also conceptualized one interaction design bus. The bus, which accommodated approximately 40 participants, had to drive from Cape Town and Windhoek. The occupants however hadn’t experienced a tedious journey, since the trip entailed co-creating workshops that focused on sustainability and interconnection. You can read more about Quest for Fire, Water, Earth and Air: An interaction design bus and art installation reflecting climate change concerns through human and elemental connectedness, here. Radio Healer is an indigenous cross-cultural collective and performances – as it is defined in the article Radio Healer: Hacking the Remote to Perform Indigenous Re-Imagined Ceremony by Cridtóbal Martinez and Randy Kemp. Radio Healer is also a project that was presented at the 13th Participatory Design Conference. 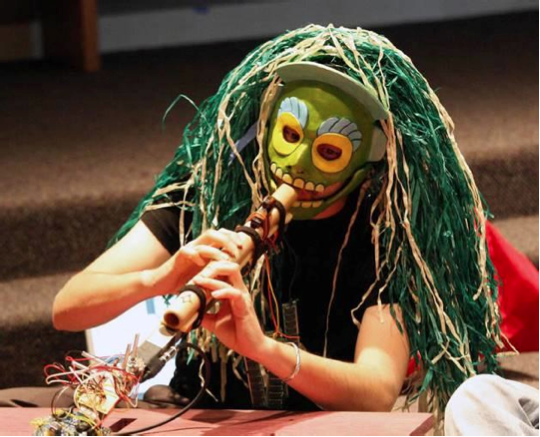 Applying both traditional music instruments and digital components, the artists represented from Radio Healer created unique performances that reflected local indigenous traditions and values. It was an intense performance that the audience experienced during the conference, as one of the artists from Radio Healer walked among the crowd and uttered short cries in the dimly lit room. The intense experience was enhanced with vibrating deep tones that was played with a use of a remote control from a Nintendo Wii. You can watch a video recording from the performance down below. According to Cridtóbal Martinez and Randy Kemp in the aforementioned article, it involves a deep knowledge of places and people, and furthermore a practicing of the Chicana/o rasquache and Native American adaptive reuse traditions to achieve their method of cross-cultural performances. The Designing Human Technologies principles shines through Radiohealer- project in many aspects. The artists also wrotes in the article: “Using adaptive reuse tradition as an innovation framework, Radio Healer artists Appropriate, salvage, and re-adapt foreign cultural artifacts and materials to create local functional, symbolic, and aesthetic designs reflecting local indigenous values”. You are more than welcome to visit the following associated link.